I don’t know why everyone doesn’t grow the Jerusalem artichoke, also known as sunchoke. This plant starts out from nothing and grows a dramatic ten feet tall in one season. It flowers in September, adding autumn interest to your garden. 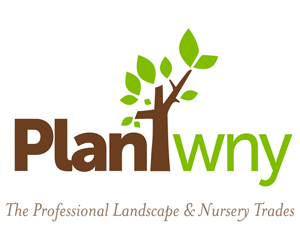 You can plant it in fall, so it gives you a chance to putter in your garden now. If that weren’t enough, it’s a food plant. The roots are delicious! I hadn’t heard of this marvelous plant until I got one in a plant exchange. Now I’m a big fan. First, let’s talk about the name. This plant isn’t from Jerusalem and it’s not an artichoke. Apparently it got the artichoke label because some people think it tastes like an artichoke. I think it tastes very much like a potato, and others describe it as having a nutty flavor. It’s not from Jerusalem. The plant is actually native to the eastern part of North America, so it grows very easily in the Buffalo area. The Jerusalem part of the name probably came from a mispronunciation of “girasole,” which is Italian for “sunflower.” The Jerusalem artichoke and the plant we commonly call a sunflower are in the same genus, Helianthus. Since the name “Jerusalem artichoke” is so confusing, it seems that people are beginning to call the plant a “sunchoke.” That label acknowledges that it is a kind of sunflower and hints at its earlier name. 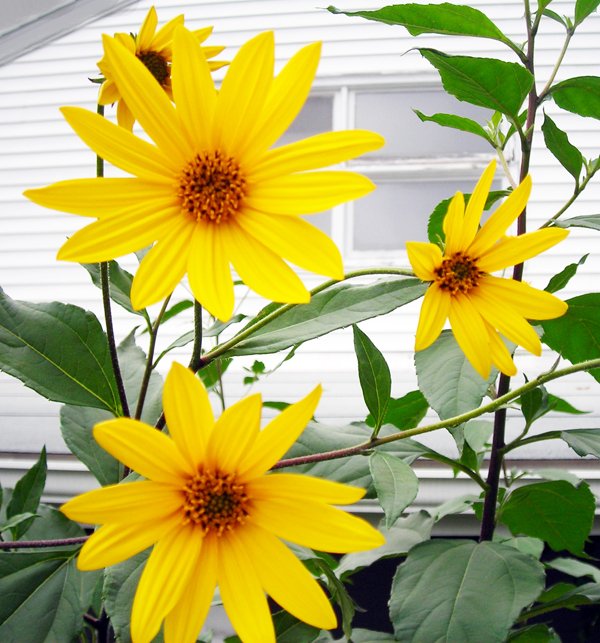 Now that we have the English name straightened out, let’s take a look at the Latin name, Helianthus tuberosus. The first word tells you what genus it’s in, and the second word lets you know what makes it different from other sunflowers: the tubers. With the common sunflower, we eat the seeds, but with the sunchoke, we eat the roots. I have to admit I was skeptical of eating sunchokes at first because the tubers don’t look appealing. The roots are hard, knobby and misshapen, but don’t let that fool you. They really are yummy. I sliced mine thin and sauted them in olive oil, then threw in chopped chives and parsley. My husband sauted them with onions and garlic. Both versions were great. There are lots of recipes online for roasting them or using them in soup. You can also eat them raw in salads. If you have trouble rinsing the dirt out of all the nooks and crannies, cut them up to better reach those areas. Don’t worry, you don’t have to peel them. There is one drawback to this wonderful plant. Some people say that the sunchoke causes flatulence. I say, so what? Many people find that garlic, green peppers or beans can make them gassy, but they eat them anyway. Take a walk on the wild side– eat a sunchoke! This plant is simple to grow. Dig a hole a few inches deep and plant the tuber. You can plant them now or in the spring; they will winter over. Choose a sunny area. The sunchokes will grow during the spring and summer and reach their full height of about 10 feet in September. That’s when they get flowers, too. After they flower, you can harvest the roots. They don’t seem to keep quite as long as potatoes do, so if you have several plants, you may want to harvest them one at a time. Leave a few tubers in the ground for your crop next year. You don’t need to plant the largest part of the tuber; one of the small offshoots (see the photo above) is all you need. You can eat the large part and plant the small offshoots. If you miss some of the tubers while you’re harvesting, you’ll get new plants from those, too. 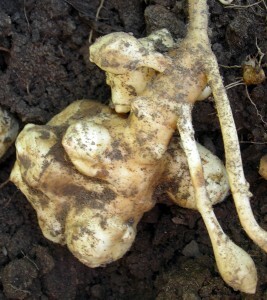 If you’d like some sunchoke tubers to plant, contact me at Connie@Buffalo-NiagaraGardening.com. If you can pick them up, that would helpful (I’m in Eggertsville). Otherwise, we’ll try to make arrangements to get some to you. I just pulled mine out this morning, and wondered how to cook them. Thank you! How wonderful! I’m glad I published the article in the nick of time for you! Be advised that the Jerusalem artichoke is highly invasive-it will take over and spread like wildfire!If you leave any tiny part of the tuber in the ground, it will grow and multiply. I planted them about 15 years ago and it took me 12 years to get rid of them from my yard although they are growing rampant in my 5 adjacent neighbors yards. They are pretty but must be kept in check or they will take over your garden. That’s a good point. It is easy to miss a few when you’re harvesting– You might get more plants than you bargained for. A good way to keep them under control is to dig them up and eat them (or share your bounty with a group like Friends of Night People). Thanks for offering that insight. These sound fun to have around! Can you please give me the latin name for this plant? The Latin name is Helianthus tuberosus. Sure! I’ll give you some at Thanksgiving. See you then. Another fun and amazing plant is the TickleMe Plant. OMG it closes its leaves and goes crazy when you tickle it.